John Chandler of Chandler Design Associates, designs books, catalogues and brochures. With international clients in a variety of industries, John has over 25 years of experience of designing everything from independently published novels to catalogues. 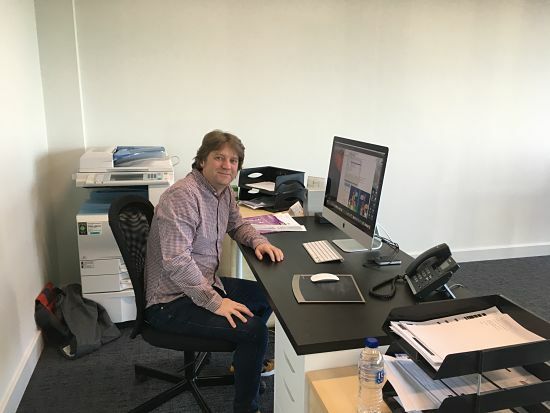 Now based at the King’s Lynn Innovation Centre, John prides himself on a quality of work and a personal service, which sees customers return again and again. We spoke to John about his business and the move to King’s Lynn Innovation Centre. While studying at art college I did everything by hand. Since then, I have continued to learn and keep up to date with changing technologies. After initially working with branding for companies, I discovered that there was a bigger market for books so made that my focus. I have since gained an extensive wealth of knowledge. I know my industry inside-out. I understand the whole process, including printing, which is invaluable. “King’s Lynn has been in need of premises like KLIC for a long time, and it is perfect for small businesses. How has moving to the King’s Lynn Innovation Centre boosted your business? I moved the business to the coworking space of King’s Lynn Innovation Centre in September 2016. It offers the perfect space, flexibility and support for Chandler Design Associates. King’s Lynn has been in need of premises like KLIC for a long time, and it is perfect for small businesses. Having a registered address here gives a far better impression than a home address. The office space itself and the facilities available are very professional and well-presented. Plus, the internet strength is great as I often need to send large files. It has been good exposure for my company. Conversations with other tenants have also led to some potential leads. What are the highlights of being self-employed? The highlight of being self-employed is being in control and having the freedom to work on the projects and the hours that I want. Currently working internationally, across Europe, Asia, North America and beyond, with two freelance artists and a freelance typesetter, I have ambitions to grow Chandler Design Associates in the next two years, and to be able to take on employees to support my business growth. What advice do you have for others starting up their own business? In hindsight, as much as I thought my first job out of college was somewhat mundane, it made me stop being a student and become a working professional, which is really valuable. Make sure you find the positives in and make the most of every opportunity you get.